The St Julien Hotel and Spa is unquestionably the most luxurious place to stay in Boulder. Located several blocks from the Pearl Street Mall, many of the well-appointed St Julien rooms offer fantastic views of the Boulder flatirons. (Be certain to ask for a mountain view when booking!) Live music — including spirited salsa bands — play on the back terrace during warm weather, and attract large crowds of skilled local dancers. The in-house St Julien spa offers a variety of services, including deep-tissue massage for outdoor-active visitors. The two ground floor bars are a great place to meet travelers and locals. If you want to maximize your comfort while in Boulder, the St Julien is the place to stay. 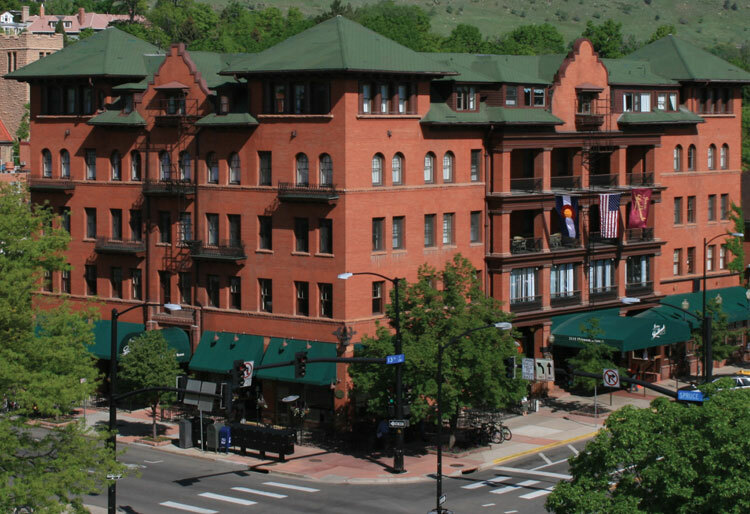 The historic Hotel Boulderado is nearly 100 years old, and was Boulder's first luxury hotel. Located one block from the Pearl Street Mall, the Boulderado is the most centrally-located place to stay in Boulder. Victorian furnishings, stained glass lobby ceilings, and plenty of dark, polished wood give the Boulderado a cozy Western elegance. The hotel's Q's Restaurant consistently wins rave reviews for its food. If you're seeking a taste of old-fashioned Colorado charm, the Boulderado captures the spirit of the state better than any other hotel in the area. Valet parking is available throughout your stay for an additional fee. Note that the hotel features both "historic" and "modern" sections — be sure to state your preference when you book a room. There are also a wide selection of chain hotels and motels in Boulder. Centrally-located options include the popular Boulder Marriott at 2660 Canyon Boulevard (303) 440-8877, the affordably-priced Boulder Creek Quality Inn at 2020 Arapahoe Avenue (303) 449-7550, and the Best Western Golden Buff Lodge at 1725 28th Street (303) 442-7450. Most national chains feature motels either in Boulder or in the neighboring towns of Longmont, Superior, Lafayette, or Louisville.